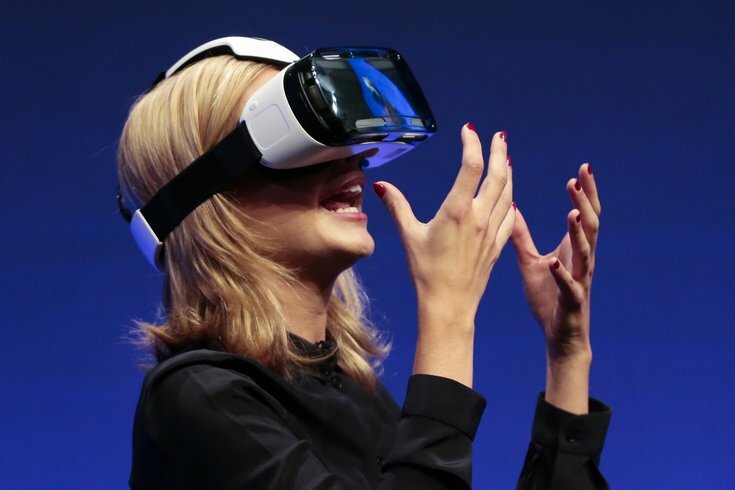 A virtual-reality headset called Gear VR is unveiled during a consumer electronic fair in Berlin. PARK CITY, Utah - Whether putting moviegoers inside the yurt of a Mongolian tribe, in the studio with a musician or in the path of an oncoming train, filmmakers are blurring the lines of reality for viewers at this year's Sundance Film Festival. This year's conclave of independent films in Park City, Utah, is devoting its New Frontier showcase to virtual reality film with 11 works, the largest such lineup in the festival's three-decade history. The content is viewed on a wraparound-style headset that projects a 360-degree panorama, giving viewers the feel of being in the action. But virtual reality films are still a long way from becoming mainstream as the headsets to display them have yet to reach the mass market. Samsung started offering its Galaxy Gear VR headset last month, which uses its Galaxy Note 4 smartphone to present virtual reality experiences. Google Inc offers the Cardboard VR device to use with smartphones. The consumer version of pioneering Rift headsets from Facebook Inc-owned Oculus VR, is still in development. "Cinema wasn't our focus in the beginning, but now it's becoming a bigger focus, so we need to immediately engage and support," said Brendan Iribe, chief executive of Oculus. The attraction of virtual reality for filmmakers lies in simulating a personal presence for viewers, who until now have interacted with content merely as voyeurs watching a story unfold on a screen. In "Herders," a short movie from filmmaking duo Felix & Paul, the viewer is placed inside a yurt with a rural Mongolian family, while in "Strangers: A Moment with Patrick Wilson," the viewer sits beside a musician working in his studio. Non-fiction films are proving to be a strong fit for virtual reality, said Felix Lajeunesse, as filmmakers can immerse audiences in the action and make them connect to the story. "Reality becomes utterly interesting in virtual reality. You don't need to necessarily change it or restage it or transform it that much," said Lajeunesse. Filmmaker Chris Milk teamed up with Vice News to document the New York Millions March in December in virtual reality, where he used a 360-degree camera to film in the midst of crowds parading through Manhattan to protest police brutality. "As the audience, you understand immediately what's going on - you are the perspective of the camera," Milk said. Virtual reality films are on the sidelines of Sundance and far from becoming theatrical staples of the festival where the main attractions are still the star-studded premieres and emergence of new talent in the competition categories. And while the festival's community works on independent budgets ranging from a few thousand to a few million dollars per movie, the cost range of making virtual reality content is still unclear. Milk said the Vice News piece was filmed on a relatively modest budget similar to that of a conventional documentary. He spent significantly more time and money creating abstract film "Evolution of Verse" with visual effects house Digital Domain using computer graphics imagery. The piece features an oncoming train amid a tranquil landscape. "The tricky part is that the technologies are still under development," Lajeunesse said. "But shooting in virtual reality and shooting in film will be very similar in terms of cost." The Sundance spotlight marks the beginning of virtual reality in film, said Shari Frilot, curator of New Frontier. "It's a chance to enter this world from ground zero and be a part of this fledgling industry that has enormous potential," she said.